The Wh ite House Initiative on HBCUs invited Dr. Jessica Venable to participate as a panelist at the 2016 National HBCU Week Conference Oct. 23-26, 2016. 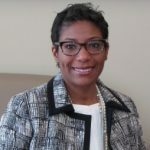 Dr. Venable, Managing Director at McAllister & Quinn, presented topics related to how HBCUs (Historically Black Colleges and Universities) can enhance their capacity for faculty success in sponsored research initiatives in STEM and related disciplines. The annual conference drew close to 1,000 HBCU presidents, administrators, faculty, community leaders, institutional advocates, and students to meet and interact with federal agency officials, private sector representatives, business professionals, and financial aid executives. The conference also provides direct information to HBCU administrators and leaders on the topics of federal funding, financial aid, and advancing student success in order to promote educational excellence within these institutions.